Italo in pink, Keala’s bold speech, a new WSL recruit and an audience with queen Natasha. 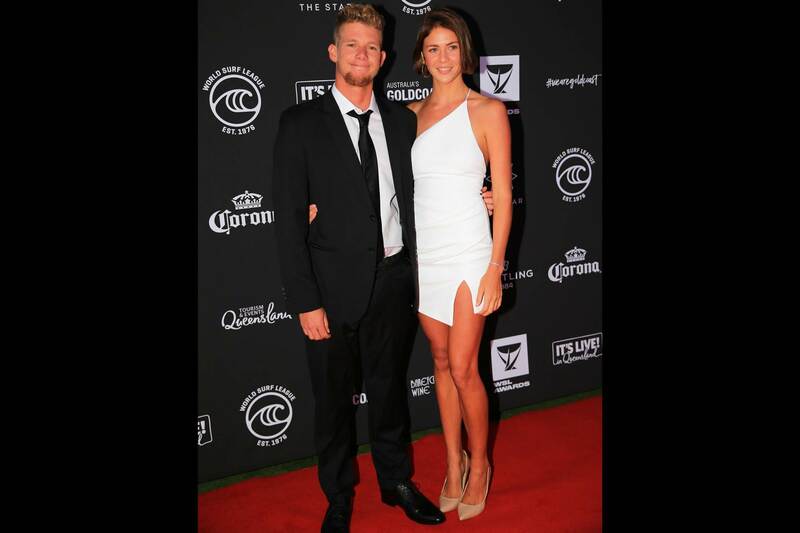 There might be no sand at Snapper Rocks but at least the weather gods smiled on the WSL for their annual awards event, held last night at the Gold Coast Casino. It had been miserable in the days leading up, but the pre-event drinks were held beneath crisp blue skies in an outdoor courtyard, on the most perfect of Autumn evenings. Was it a good omen for the WSL? A giant, cinema-size screen beamed imagery of the year that was, its blinding brightness only topped by the shimmer of Soleil Errico’s gold dress (Women’s world long Boarding champion). It is always curious to see those salt-stained surfers in suits and frocks. Italo Ferreira won the fashion final for the men; his baby pink suit marvellously offset by a fresh, blonde bleach. 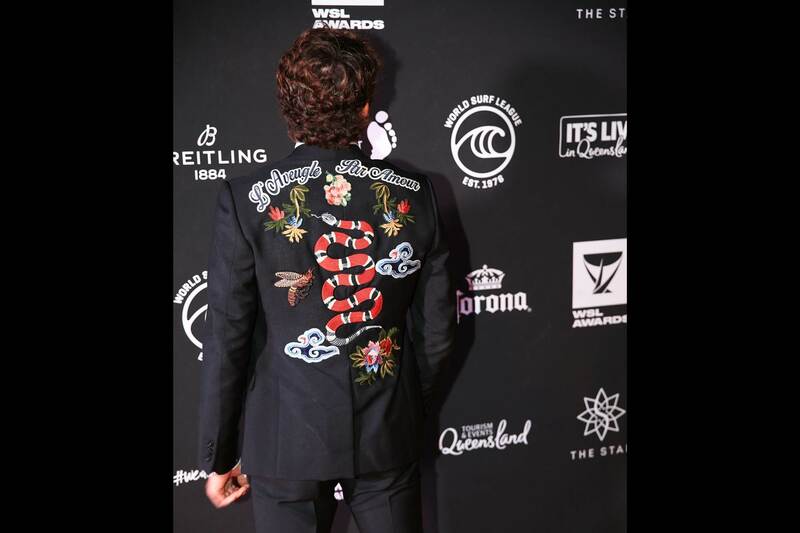 It reminded me a little of Mugatu, Will Ferrell’s over the top character from Zoolander, but Italo definitely pulled off the risky dress move, outpointing Leo Fioravanti in his customised Gucci jacket and the original Mr Pink, Peter Townend. Once ushered inside to the auditorium the crowd was greeted by that oh so familiar voice of Joe Turpel, who kicked off proceedings with a nice little bit of self-deprecating humour. “Good evening … I’m honoured to be your fifth choice for hosting tonight’s event.” Joey was under pressure to keep it tight as the whole thing was being broadcast live to Foxtel. There could be no two-minute stream of consciousness sentences, no historical throws to an absent Pottz, just slick, time sensitive delivery to ensure it was all wrapped up before the next Foxtel program was scheduled to start. You have to give it to Joey though, he is the eternal, unflinching anchorman and the budget-tightening WSL definitely get their money’s worth out of him. Word is the WSL have a new back-end recruit. A former producer from ‘The Oprah Winfrey Show’ has been ushered in with a brief to dial up the drama and keep things a little more raw and real. Let’s hope. 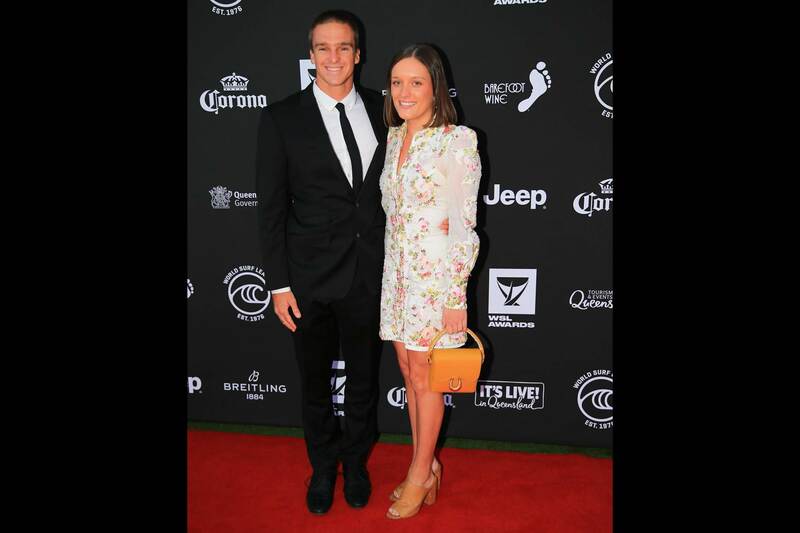 The first big speech was made by Natasha Ziff, the co-owner of the WSL along with husband, Dirk. 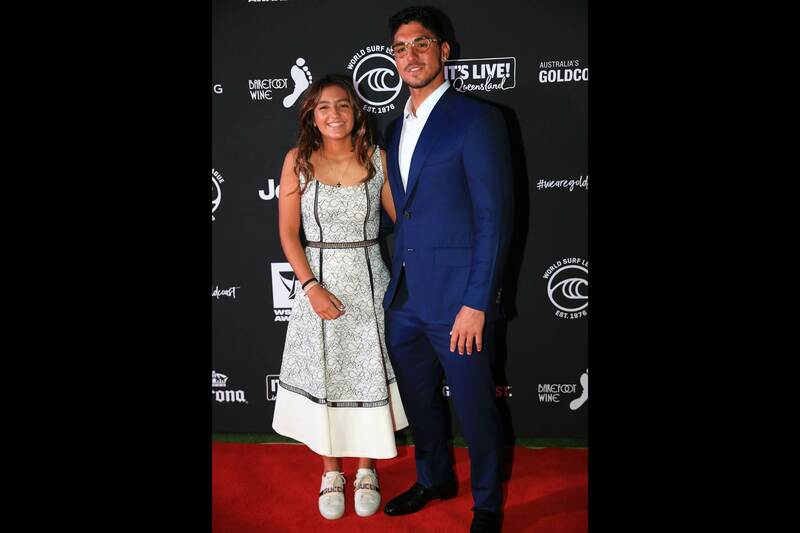 When the whole existence of the WSL and the sport of professional surfing more or less hinges on the continued financial support of one wealthy couple they do feel a little bit like royalty when they are in a room with all their loyal surfing subjects. In what was quite a touchy feely speech, the focus of Natasha’s dialogue was to draw attention to the introduction of pay parity for men and women and surfing. “We are leading the way for other sports,” the benevolent queen rightly pointed out. Some love to throw lashings of criticism at the WSL, but perhaps all surfers should be proud that the sport they love to watch and whinge about is, as Natasha points out, setting a major precedent for equal pay in all sports. 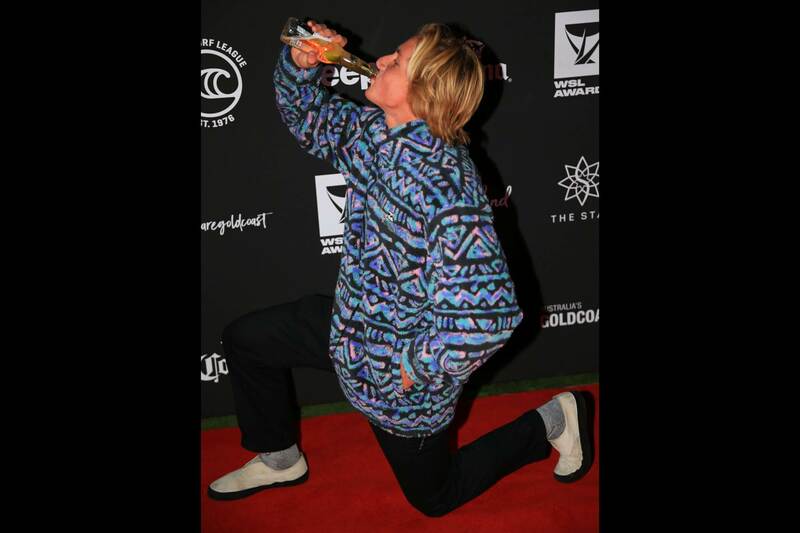 Of course there were awards to give out – rookie of the year and winner of the WQS and a bunch of others that are all pretty self-evident. Manoeuver of the year at least has a little unrevealed mystique about it. That accolade belonged to Carissa Moore in the women’s and Filipe Toledo for his high-altitude backside rotation in Brazil. All the other awards will be posted on WSL but they won’t tell you who was on the naughty table where Fin McGill, Ethan Osborne and a bunch of the new Airshow Top Guns were hooting and hollering through the speeches and doing their darndest to add a little rebellion to a straight-laced affair. Well it was free booze and some people didn’t have to surf a WCT contest in a couple of days so why not have a little fun. Truth be told it was all pretty tame; this was not a crowd that raged like it was an early 90s pro surfing shindig. The strict time demands of a live broadcast meant there were casualties. Talk for too long and that music would kick in, you know the kind that they play at the Oscars when it’s time to wind it up. Young Mateus Herdy was given the cue to exit stage left during his world junior title acceptance speech and poor old Robbie Bain was lamenting the fact he didn’t even get a word in about his world title win for the world masters, but that’s showbiz. Accepting her world title award, Step Gilmore demonstrated she has a deft turn of phrase in addition to a spectacular top turn. “I’m dressed a little more casually tonight because I dropped a guitar on my foot the other day,” she explained. “And I can’t work out if that means I should put the guitar down and practise surfing more or if I should quit surfing and go and embrace my life as a struggling musician.” Perhaps at next year’s awards we will see Steph and Kelly play as a duo and announce plans to go on a music tour instead of the pro tour. The bravest speech of the night definitely belonged to women’s big wave champion, Keala Kennelly. 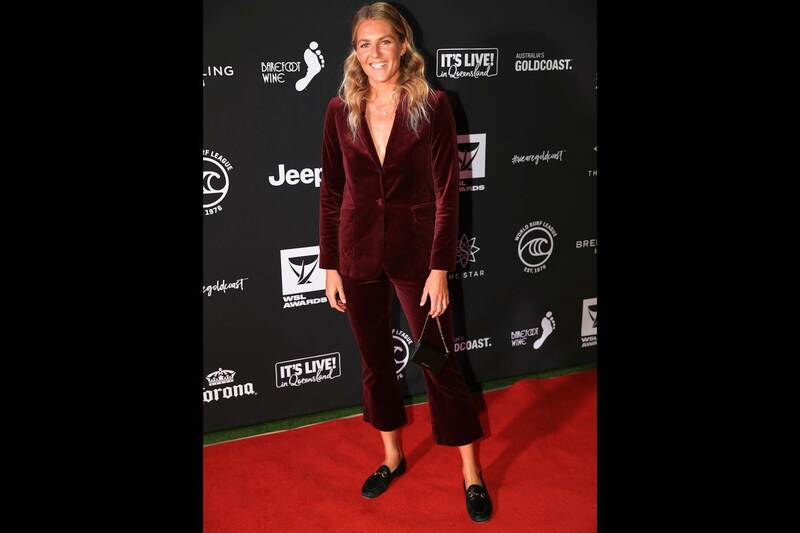 Kennelly spoke of being a 25 year old surfer who had finished number two in the world on the women’s circuit and hated herself for failing to achieve her dream of becoming number one, but even more so because she was hiding her sexuality and ashamed to reveal it. “But, I had to dream bigger,” Keala proclaimed on stage. “So that I could become the first openly gay female world champion… everyone should dream the big crazy dream.” The bold and well-delivered speech drew the loudest applause of the night. Finally there was Gabriel Medina, the world champion who was never going to win just one of the things and is likely to claim a bunch more. John John was there to hand over the trophy and that’s all we saw of the fleeting Florence. Meanwhile Medina mocked his poor English and delivered an impassioned speech about his Gabriel Medina institute, which provides coaching and training for talented young Brazilian surfers and others facing a range of challenges. Medina’s final message was a description of his own motto. “Stay hungry, persevere and count your blessings.” It’s advice that the WSL itself may be well advised to take. 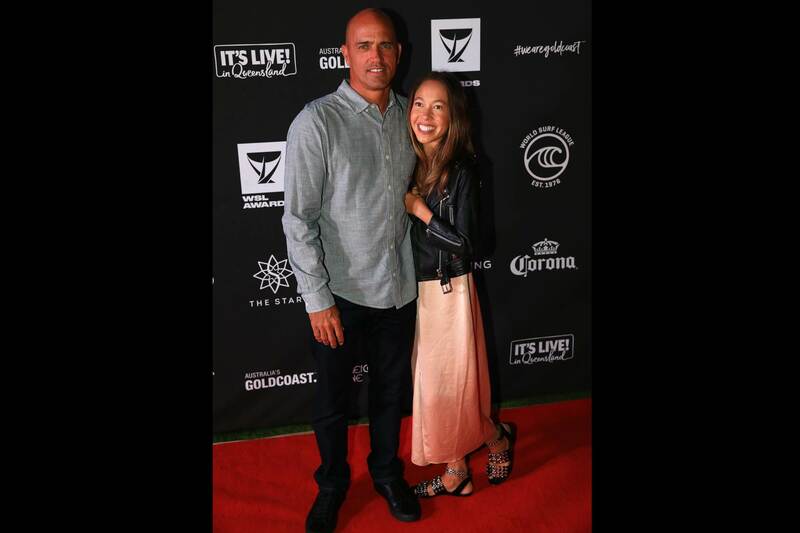 While Dirk and Natasha Ziff have kept things afloat, it seems the WSL business is under pressure to turn a profit. The contest site is decidedly more austere and the competitor’s area, once dubbed the Taj Mahal, is half the size it was in previous years. The cost-cutting measures have been implemented. The WSL will have to move and operate like a hungry Gabriel Medina in 2019. Their awards night at least had an air of sincerity. The surfers may have had time limitations but they were certainly given the liberty to speak their hearts and minds. Maybe that’s all the WSL needs just a little more straight-up, raw and revealing coverage. The stories are there to tell, they just have to be brave enough to do so without the gloss coat.